Yellow vest demonstrators are planning a 21st straight week of protests across France on Saturday, two days after the Constitutional council struck down a provision in a law that would have let authorities ban certain individuals from protesting. Two routes across Paris have been approved, though gatherings are still banned on the Champs Elysees. The Council, which rules on the validity of laws, said the anti-riot law gave officials "excessive latitude" in imposing bans against individual people suspected of being threats to law and order. The provision in the law, which passed both houses of parliament, was inspired by anti-hooligan measures that keep out known troublemakers from football stadiums. Critics said it arbitrarily infringed on the right to freedom of speech and assembly. The council upheld other measures, including more severe penalties for organisers of unauthorised demonstrations, and for people who cover their faces during violent protests, who can be fined up to 15,000 euros. The government has vowed to crack down on the destruction brought by some protesters in past weeks, and police banned recent demonstrations on the Champs-Elysees in Paris as well as in other city centres. This weekend, the prefecture renewed the ban on the Champs-Elysees, as well as around the Arc de Triomphe. Two routes through Paris have been authorised, one from Place de la Republique to La Defence, organised by Eric Drouet, a main figure of the movement, and one running south to north, from Montparnasse to the Bassin de la Villette. There has been a call for a national gathering in Rouen, and a women are called to Lille, dressed up as Marianne, the national symbol of the French republic. Other groups have called for gatherings in Lyon, Dijon, Nice, Montpellier, Bordeaux and Toulouse. 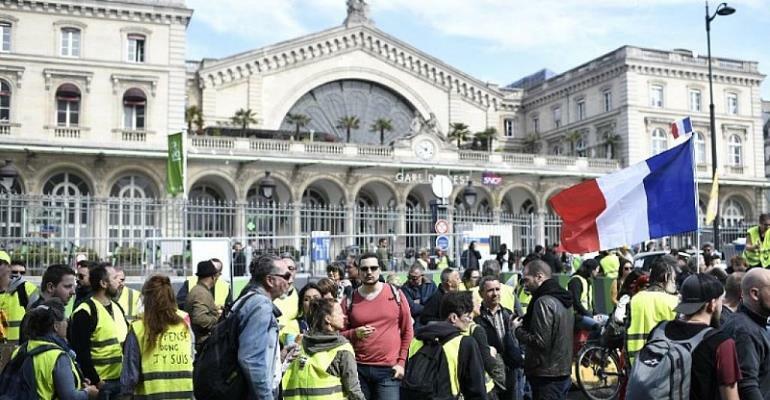 Some 500 representatives of groups from around France are expected in Saint-Nazaire for a second “assembly of assemblies”, to work on different forms of organisation of the leaderless movement. The last such meeting took place in January, with 300 people representing 75 local groups.